Implementing community based early warning in Thailand, in collaboration with regional partners, SEI is undertaking a participatory assessment of the enabling conditions for implementing community based early warning in the Indian Ocean. 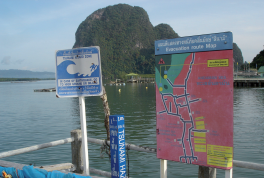 As part of the Sida funded programme, 'Sustainable Recovery and Resilience Building in the Tsunami Affected Region', Frank Thomalla and Rasmus Klocker Larsen recently conducted field visits to Krabi Province in Southern Thailand. The visits were facilitated by the Asian Disaster Preparedness Centre (ADPC) and Raks Thai, respectively. Initiated at the Kobe Conference in 2005, the development of the Indian Ocean Early Warning System (IOEWS) is well underway under the lead of UNESCO's Intergovernmental Oceanographic Commission (IOC). A large number of organisations are engaged in disaster preparedness in the region and considerable knowledge regarding the technology-human interface of Early Warning Systems (EWS) and the issues pertaining to community preparedness and disaster resilience, or the so-called “last mile”, exist. It is widely appreciated that there is considerable variation in the effectiveness of EWS in transmitting messages of an actual threat into actions at the community and household level. Once a message is received, it is critical that actions taken are appropriate and rapid to minimise potential losses. Despite the large influx of international funds for the development of an EWS for the Indian Ocean, there is a lack of financial and staff capacity for disaster management activities at the lower levels of government and very little support for community-based disaster risk management (CBDRM). As a result, CBDRM relies heavily on volunteerism but in the absence of support from the government, there is widespread concern that these activities are not sustainable in the longer-term. Disaster Risk Management (DRM), in isolation of more pressing issues in communities, is not considered a priority by many communities, even some of those severely affected by the 2004 Tsunami. DRM activities, therefore, need to be integrated in strategies that address wider community priorities, such as improving and diversifying livelihoods and building capacity for community-based natural resource management. Whilst outlining different needs and interests, most stakeholders agree that there is a problem of lacking implementation on the ‘last mile’. This suggests that stakeholders hold different interpretations of what should be implemented, interpreting EWS related policies differently and with varying motivations for engaging in EWS activities. Thus, the negotiation of roles and responsibilities and conflicts of interests lie at the core of the lack of implementation. To address these challenges, expert guidance is not always relevant and there is a need to establish a process of ‘learning by doing’ that is enabled by adequate feedback mechanisms from practice back to the formulation of policy and guidance. Macquarie University is about discovery, learning and participation in a borderless world.